Jonathan Y. Tan is Archbishop Paul J. Hallinan Professor of Catholic Studies in the Department of Religious Studies and affiliated faculty in the Chinese, Ethnic Studies, Asian Studies, and International Studies programs at Case Western Reserve University in Cleveland, Ohio (USA), as well as Co-Chair of the American Academy of Religion's World Christianity Group. Jonathan holds a Ph.D. from The Catholic University of America (Washington, DC), a M.A. from the Graduate Theological Union (Berkeley, California), and a LL.B. (Honours) from the National University of Singapore Law School. Previously, he taught at Australian Catholic University (Sydney, Australia) Xavier University (Cincinnati, Ohio) and The Catholic University of America. Jonathan is the author of Introducing Asian American Theologies (Orbis Books, 2008). His recent book, Christian Mission among the Peoples of Asia (Orbis Books, 2014) has been named by the International Bulletin of Missionary Research as one of 15 outstanding books of 2014 for mission studies. He is also the lead editor of World Christianity: Perspectives and Insights (Orbis Books, 2016), which has been named by the International Bulletin of Mission Research as one of the 10 outstanding books of 2016 for mission studies, and co-editor of Theological Reflections on the Hong Kong Umbrella Movement (Palgrave Macmillan, 2016). 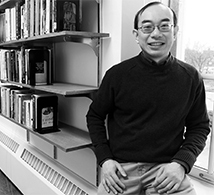 Professor Tan's Course Websites (current & archived). Revision 10.001 | Originally created: 29 March 2005 | Last updated: 30 August 2017.